She Murdered Me With Science by David Boop, a Mysterious Review. Review: David Boop combines historical fact and fiction, science fact and fiction, places real and imaginary, and a private investigator named Noel Glass in She Murdered Me With Science, an interesting, if at times uneven, mystery set in the early days of the Cold War. Noel Glass is a young, brilliant scientist, one of the country's top researchers working on projects vital to the national interest at the prestigious New Mexico Institute of Technology (NMIT). Or he was until an accident killed several people, including his fiancé. Stripped of his credentials, he's lost everything that meant anything to him. Now, 14 years later, he works as a private investigator, generating just enough money to continue research on science projects in a one room apartment in Industry City, Colorado. When the city's wealthiest resident, C. J. Reese, approaches him with a proposal to develop his latest invention, he's skeptical. But then he learns the real reason the man's generosity: he's slowly being murdered and believes that Noel can save him. As an added incentive, he'll provide Noel with proof that he wasn't responsible for the accident that destroyed his career and killed his fiancé. When Reese is suddenly killed, Noel leaves on a quest to find out who was behind the "accident" years ago, and more importantly why. 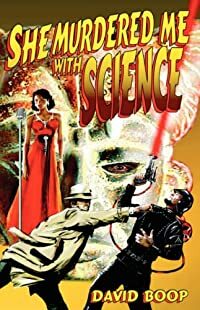 Though set in the 1950s, She Murdered Me With Science has a oddly compelling futuristic noir style to it that gives the book a sharply defined, innovative feel. The retro language and cutting edge technology also contribute to this dichotomy. Read as a mystery, it has all the requisite elements: a murder, an investigator, red herrings, and the like. Yet there is a sense that despite the situations Noel finds himself in, he's rarely in any real danger and the outcome of his search for the truth is never in doubt. (The title also doesn't help as it obviously points to the gender of the culprit of which there are, maybe, two in the entire book.) This is due in large part because his character morphs into someone who is absolutely sure of himself and his abilities, in stark contrast to the Noel Glass that's introduced to the readers, one who was defeated, mentally, emotionally, if not intellectually, by the accident at NMIT and was living a day-to-day existence on the fringe of society. Mere event-filled and action-packed days after leaving Industry City, he's discussing international politics and strategy with the President of the United States. It's all a little too sudden and a little too implausible. Read as science fiction, however, rarely is anything implausible and that's probably where She Murdered Me With Science works best. The mix of history and science here, most of it fact and some of it obviously fiction, and the political paranoia that existed between the US and Russia in the years after World War II, all contribute to what is, in the end, a really good, believable (at least in the context of science fiction) and well-reasoned thriller. Acknowledgment: David Boop provided a copy of She Murdered Me With Science for this review. Location(s) referenced in She Murdered Me With Science: Colorado, New Mexico, Nevada, Chicago, Illinois.